← Donald Trump gives 737 MAX advice to … Boeing? Mother Nature has splashed cold water over SpaceX’s triumphant triple booster landing in the wake of last week’s Falcon Heavy rocket launch. Literally. After sending the Arabsat-6 telecommunications satellite on the first leg of its journey to geostationary orbit on April 11, the three first-stage rocket cores went their separate ways. Two side boosters touched down safely at SpaceX’s Landing Zones 1 and 2 at Cape Canaveral Air Force Station, not far from their launch pad. The center core landed on a drone ship christened “Of Course I Still Love You,” stationed several hundred miles offshore in the Atlantic Ocean. 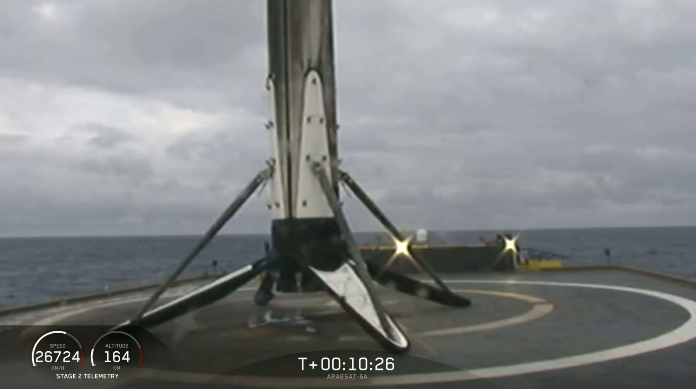 The center core’s landing was a first. During the Falcon Heavy’s maiden launch in February 2018, the center core missed its target. SpaceX was planning to reuse all three cores — as well as the two halves of the rocket’s nose cone, or fairing — on future launches. Unfortunately, the center core didn’t make the trip back to shore intact. This entry was posted in GeekWire and tagged Falcon Heavy, Space, SpaceX. Bookmark the permalink.